Apparently, this past week some "Penn-hopeful" high school students have had the luck of the Irish, while others, well, ...not so much. Over the past week, I've been seeing lots of "got into Penn!" and "damn you Penn!" type tweets in my Twitter feed. 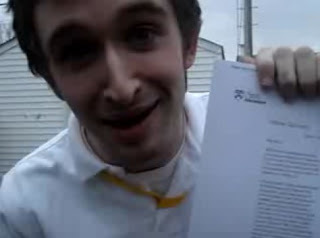 It's one thing when you're accepted into Penn (click HERE to see a 2012 acceptance letter being opened, as well as my own acceptance letter). While this video was probably taken sometime last April, it still holds up. I wonder if this kid ever got taken off the wait list. Anybody?